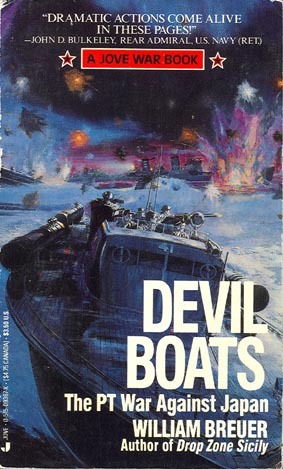 “DEVIL BOATS” The PT War Against Japan. By William Breuer. Foreword by Rear Admiral John D. Bulkeley, USN (Ret.). The PT boat was a class of motor torpedo boats used by the United States Navy during World War II. Armed with a single 40mm antiaircraft, two 20mm antiaircraft guns plus four torpedo tubes the PT’s agility and speed consistently bested even the most outlandish expectations. Against Japan, they figure prominently in some of the best-known feats of heroism of the entire Pacific war. 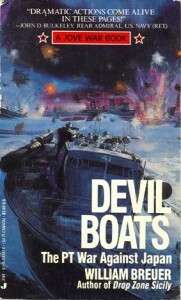 In “Devil Boats” the reader is on-board a PT, in the Pacific just minutes after the Pearl Harbor disaster of December 1941. Relive the intense moments when a PT, with her engines muffled, sink an enemy warship, blow-up a supply barge, carry a sabotage team past Japanese lines, or effect another extraordinary rescue of a downed Allied pilot. In instance upon instance, the PT boats and their gallant crews performed deeds demanding incredible courage and skill, pitting their plywood craft against the force of the angry sea, or the might of vessels hundreds of times their own size. Among their legendary exploits––General MacArthur rescued from the besieged island of Corregidor in 1942. And the unforgettable heroism of a wounded John F. Kennedy and his fearless PT-109. 1988 Paperback. 219 pages, 40 black and white photos, 4 maps, 1 PT boat diagrams and an index.